CARLSBAD — U.S. Senators Tom Udall (D-N.M.) and Martin Heinrich (D-N.M.) and Representative Steve Pearce (R-N.M.) joined U.S. Department of Energy Secretary Ernest Moniz Tuesday at the Waste Isolation Pilot Plant (WIPP) for an “all hands” employee meeting and surface tour of the site. Moniz and the legislators also attended a town hall with Carlsbad residents Monday evening. 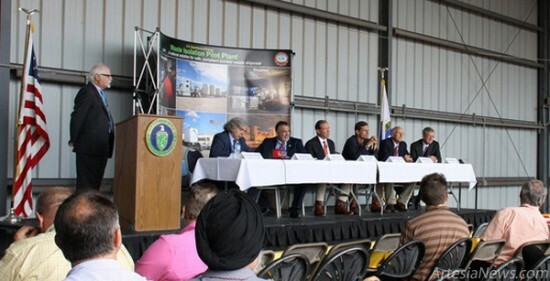 Throughout the visit, the lawmakers underscored the importance of getting the WIPP reopened safely, and they highlighted how important the WIPP is to the community and to national defense. … For the rest of the story, subscribe in print and on the web.